The hardware for this project included a Reliable Controls® MACH-ProWeb with two EIA-485 channels, one dedicated to third-party integration for the chillers and mechanical room variable frequency drives (VFDs), and the other for MACH-Pro controllers. A MACH-ProWebSys™ was installed to serve the mechanical room, monitoring refrigeration levels, room temperature, system pressure, and water flow. A second MACH-ProSys™ located in the penthouse was installed to control all aspects of the cooling tower. Mechanical equipment on site included two screw chillers and two VFD controlled, 15 HP fan motors. Flow sensors were installed to monitor total system flow and to adjust the modulating bypass valve to ensure minimum flow through the chiller. The entire system was recommissioned and put back in to service promptly and to the customer's satisfaction. Challenges on the job included a non-functional existing sequence of operation, nuisance alarms, and problematic lock-outs. A more thorough and appropriate sequence with improved modes was developed to resolve the issues. The variable flow nature of the system would not have been advisable without the MACH-Pro controllers, coupled with a good team behind the programming and start-up. The customer is very satisfied with the new control system, which now provides control, monitoring, and remote access. 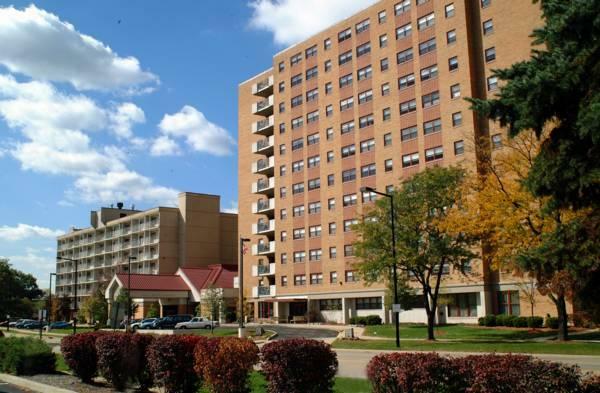 Akron Metro Housing Authority — Belcher is a 12-story, multi-use housing and office complex, which required a retrofit to the existing old, degraded system.